A Sony affiliate plans to launch large Field Emission Display (FED) TVs next year, a move that could see the firm trump attempts by rivals to commercialise a similar next-generation telly type: Surface-conduction Electron-emitter Display (SED). 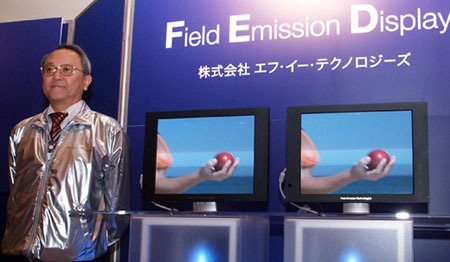 According to a report by Japan's Nikkei newspaper, an unnamed source has claimed that Field Emission Technologies (FET), of which Sony owns 37.8 per cent, plans to launch an industry-grade 26in FED TV at the end of 2009. A 60in commercial model could follow sometime later. FEDs are only a couple of millimetres thick and generate images with an array of carbon nanotubes electron emitters. Each emitter is positioned right behind a phosphor dot which emits light when zapped with electrons. The particles are emitted by a process called field emission. FEDs are claimed to have several benefits over the likes of LCD and plasma, not least an energy efficiency that's roughly twice that of LCD. Other benefits include FED’s ability to generate much crisper images than LCD can, along with better blacks. Because fewer components are required to display a picture, FED sets could be cheaper to produce. Both Canon and Toshiba have already unsuccessfully tried to launch TVs based on SED, a close variant of FED. Like FED, SED uses an electron emitter for every pixel and places them all very close behind a phosphor-coated display panel. The key difference is the way electrons are emitted. Toshiba was due to launch its first Canon-developed SED screens in Q4 2007. But it was forced to delay the launch because it claimed Canon wasn’t able to provide SED panels to the original schedule. Sony is currently in negotiations with Pioneer to buy its former plasma-panel production plant in Kagoshima, Japan. In March, Pioneer officially announced plans to can its plasma production after making a loss for the fourth year running. It’s thought FET will produce around 10,000 26in FED panels each year at the former Pioneer plant, with screens mostly sold into broadcasting and medical areas.